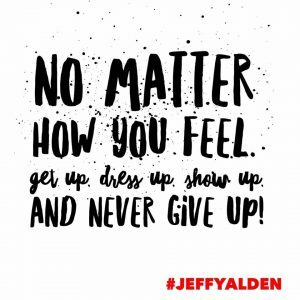 My name is Jeff Yalden. I’m a teen suicide prevention and crisis intervention expert and teen mental health speaker. If you are in crisis or experiencing an emergency, please call 911 immediately – and always remember that it’s OK to ask for help. When a teen makes that that “forever decision” to end his or her life, people want to know why. What drives a young person to suicide? Today, teens experience pain as fast as the flip of a switch – like turning a light bulb – and terrible situations can cause a teen suicide. One of the things that hurts today’s teens is the inability to cope with life’s challenges and problem solving in the obstacles and situations they face. What can be perceived as everyday life situations and challenges to adults can be insurmountable for a teenager today. We have an epidemic on our hands – and we need to start talking about it. The trend is that in the next decade we will have a 31 percent increase in teen suicides, drug addiction, and alcohol abuse. These issues factor in to what is quickly becoming the biggest public health crisis of our time. While the factors I will be addressing here are all driving contributors to teen suicide, often the underlying issue is one of mental illness. Most teens who attempt suicide do so because of depression, bipolar disorder or borderline personality disorder. These disorders amplify the pain a teen may feel. It is because of this that every suicidal teen should be treated by a medical professional. Remember this: Teens attempt or succeed in suicide not because of a desire to die, but, rather, in an attempt to escape a bad situation and/or painful feelings. It is rare that only a single event leads to suicide. A single event can be the straw that breaks the camel’s back, but it is quite rare a single event prompts a suicide attempt. By helping a teen turn around a bad situation or by teaching her or him how better to deal with painful feelings, we can defeat the causes of teen suicide. Most times, this requires professional help by a doctor or a psychotherapist and may also involve the teen’s school, such as in cases of teen bullying. Being a teenager is one of the most difficult phases of life. Many teenagers feel alone, isolated or somehow set apart – but they refuse to admit that they need help. They need help. They really do. Everybody needs help at times – whether it’s obvious or not, and whether we want it or not. Most of the time, we have convinced ourselves that we can manage everything on our own, but in reality, we can’t. When they feel alone, what do teenagers do? They open up their phones, computers, tablets – fire up the Internet and social media platforms or text a friend, hoping that someone does care about them – and the desire is strong that others will appreciate them for who they are. The reality is that some people appreciate you for who you are, but others simply fake it. How can you know the difference? Parents don’t understand teen problems even if they say they do. The Internet, social media, texting and YouTube is where they go to find something – the passion that they lost or the happiness that they need. It’s not that our teens think happiness is available on the Internet, but it’s a distraction from what they’re feeling. This distraction is very useful when they are feeling lonely. Imagine that they go on the web and find someone their same age, dealing with the same issues that they are. It’s comforting for them to know that they are not the only one having that particular problem. You can see their point of view. Now they’ve made friends – virtual friends that they wish were real and were right beside them. But they aren’t. Why is this? It’s a sad world that teens say they’re living in. Adolescence is always an unsettling time, with many physical, emotional, psychological and social changes that accompany this stage of life. Research suggests hours upon hours of time in front of phones, on computer screens and tablets might worsen depression and increase thoughts of suicide. Here is the deal: Depressive symptoms are more prominent in teens who spend too much time on their devices. But how much is too much? More than four a day is alarming. Ideally, we’d like to see a maximum of two hours a day of screen time for our teens. That is considered the safe zone. Nearly half of teens who got five or more hours of screen time each day had experienced thoughts of suicide or prolonged periods of hopelessness or sadness. That’s nearly double that of teens who spent fewer than an hour in front of a screen. Although we can’t blame smartphones for the increase in mental health issues in teens, I will tell you this: Smartphones and social media are by far the biggest changes in teens’ lives in the last five years. Coincidentally, over the last five years, the number of teen suicides has spiked, and this is staggering. What is further alarming is that very young children are spending triple the amount of time on phones and tablets than they did even four years ago. Teens don’t let change happen, because when something is different, they want to change it back to normal, but what is normal today? Young people struggle with having to look good for other people, and when they do it to make a positive change for themselves, they run the risk of being judged or ridiculed. They’re not accepted for who they really are. Most teens interviewed after a suicide attempt say that feelings of hopelessness and helplessness prompted them to try to take their lives. Suicidal teens often feel like they are in situations that have no solutions. They see no way out but death. Teens often feel they lack the power and control to change their situations. Other emotional causes come from trying to escape feelings of pain, rejection, hurt, being unloved, victimization or loss – that their feelings are unbearable and will never end. They think the only way of escape is suicide. Unrealistic academic, social, or family expectations can create a strong sense of rejection and can lead to deep disappointment. When things go wrong at school or at home, teens often overreact. Many young people feel that life is not fair or that things “never go their way.” They feel stressed out and confused. To make matters worse, teens are bombarded by conflicting messages from parents, friends and society at large. Today’s teens see more of what life has to offer — both good and bad — on television, at school, in magazines and on the Internet. Try to make new friends.Healthy relationships with peers are central to a teen’s self-esteem and provide an important social outlet. Participate in sports, job, school activities or hobbies.Staying busy helps teens focus on positive activities rather than negative feelings, behaviors or peer pressure. Join organizations that offer programs for young people.There are myriad social programs geared to the needs of teens to help develop additional interests. Ask a trusted adult for help.When problems are too much to handle alone, teens should not be afraid to ask for help, but adults need to be present for teens without lecturing or making them feel that their feelings aren’t valued. But sometimes, despite everyone’s best efforts, teens become depressed. Many factors can contribute to depression. Studies show that some depressed people have too much or too little of certain brain chemicals. Also, a family history of depression may increase the risk for developing depression. Other factors that can contribute to depression are difficult life events (such as death or divorce), side-effects from some medications and negative thought patterns. Situations often drive the emotional causes of suicide. Bullying, cyber bullying, abuse, a detrimental home life, loss of a loved one or even a severe breakup can be contributing causes of teen suicide. Often, many of these situations occur together to cause suicidal feelings and behaviors. Suicide is rarely the result of one factor. It’s amazing how much information our teens have access to on the Internet – some of which can be traumatizing. In addition to cyber bullying which is a major problem today, kids can now easily access information about how to hurt themselves or how to harm others. Today’s media continues to become more sophisticated and graphic, exposing our teens to many potentially negative and dangerous influences than their parents could ever have encountered a generation ago. Any form of bullying, whether face to face or online is known to be connected to depression and suicidal behaviors in our teens. 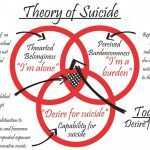 While I don’t think teens want to die, I think they don’t know how to ask for help, which could lead them to the only other option they believe is available to them – Death by suicide! This saddens me the most because I think asking for help should be as easy as asking any other question. WOW! Today’s young people think deep. Many parents don’t acknowledge that their child is struggling. Mental Health isn’t an option for many families, and this makes it harder for our schools to help. Many school counselors then don’t have those teens on their radar, because they don’t know what they are going through. How do you expect our schools to help when they’re not aware, and we’re dealing with parents who say they will take care of their problem at home? A large part of the work we are all responsible for is challenging the stigma that surrounds teen mental health – AND ELIMINATING IT ONCE AND FOR ALL. Teens need adult guidance more than ever to understand all the emotional and physical changes they are experiencing. When teens’ moods disrupt their ability to function on a day-to-day basis, it may indicate a serious emotional or mental disorder that needs attention — adolescent depression. Take action immediately. Do something. Getting help is OK! Mental illness is an economic issue that is quickly becoming the greatest public health crisis of our time. We must take responsibility, and a large part of that responsibility lies in getting comfortable with being uncomfortable and talking about teen suicide. This is an epidemic that is alarming and getting worse. 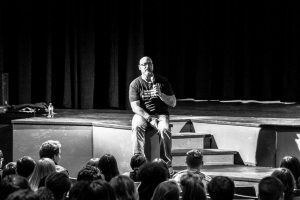 If you are interested in me visiting your school community, please visit www.JeffYalden.com or my non-profit foundation www.JeffYaldenFoundation.com. Day 7 – Attitude of Gratitude: Struggling to find Gratitude, but that’s a good thing. Shout out to Mike and Becky. Their son took his life 6 months ago. 16 years old. #GratitudeLife #BOOM #AttitudeofGratitude #Parenting #GratefulThis is for you Mike Bina and Becky Bina #Cresco #Iowa #Kyler. If you have been keeping a gratitude journal, there are times when it seems like a struggle to pinpoint things you are grateful for on a daily basis. But remember to embrace the people and the moments in your life that lift you up, inspire and challenge you. 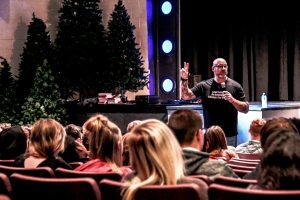 When he recorded this episode of The BOOM Podcast, mental health speaker and Amazon bestselling author Jeff Yalden said he had been struggling to find daily gratitude, but that’s a good thing. Jeff woke up on this particular morning and thought about his new friends, Mike and Becky Bina, who recently lost their son Kyler to the forever decision of suicide. Jeff recently spoke at a suicide awareness event set up by the Binas in Cresco, Iowa – and that is where they began their bond of friendship. If the above seems insensitive or unsympathetic, that is not Yalden’s intention. Far from it. Most of us have experienced hardship in life, and some of us have been devastated by unspeakable loss – but we wake up the next morning. Life is a series of victories and defeats. Jeff reminds us that we are not victims in life, and we should never play that card. We cannot have that mindset. We are not victims. We rise up and become victors. But I’m thinking of gratitude – we are not a victim in life – we can’t play that card. We can’t have that mindset. We are not a victim. Rise up and become a victor. “We can all be bitter and angry over circumstances and situations, but what does that do? It doesn’t help. Let’s choose to become better. That’s a mindset,” he said. We all have a story, but do our stories define us – or do they shape us? Death by suicide not only affects the person who died, but also others – “Suicide Survivors” – who loved and cared deeply about the person. If you are a student survivor, this experience may be one of the most challenging experiences that you’ve ever faced. While there is no easy way to grieve, it is often helpful to understand what you might experience through the grieving process. The shock and grief that consumes you after you lose someone to suicide is overwhelming. It can feel like you have fallen into a deep hole and will never be able to get out. These are natural feelings which will likely change as you move through the grieving process. SHOCK: “I feel numb.” Feelings of being dazed or detached are a common response to trauma. Shock can protect the mind from becoming completely overwhelmed, allowing the person to function. DENIAL: “I feel fine.” Sometimes people can consciously or unconsciously refuse to accept the facts and information about another’s death. This process can be even more challenging when there is little information or explanation about a loved one’s suicide. Eventually, as you gather information and accept that you may not be able to know everything, you can begin to process the reality of this tragic event and all the emotions that come with it. In time, however, our minds become more able to analyze the tragic event, and this allows the denial to give way to less troubling emotions. GUILT: “I think it was my fault.” Feelings of guilt following a suicide are very common. Guilt comes from the mistaken belief that we should have, or could have, prevented the death from happening. Guilt can also arise if there are un-reconciled issues with the deceased or regret about things said or not said. In truth, no person can predict the future, nor can they know all the reasons for another person’s actions. It is human nature to blame oneself when experiencing a loss, rather than accepting the truth that some things were out of our control. SADNESS: “Why bother with anything?” Once the initial reactions to the death by suicide have lessened in intensity, feelings of sadness and depression can move to the forefront. These feelings can be present for some time and can, at times, be triggered by memories and reminders of the loved one who was lost. Feelings of hopelessness, frustration, bitterness, and self-pity are all common when dealing with a loss of a loved one. Typically, you gradually learn to accept the loss and embrace both your happy and sad memories. ANGER: “How could they do this to me?” Feelings of anger towards the person you have lost can arise. Many who mourn feel a sense of abandonment. Others feel anger towards a real or perceived culprit. These feelings can be complex and distressing when they are directed at the person who died. It is important to know that it is possible to both be angry with someone, and to still hold them dear in your heart. Sometimes anger is needed before you can accept the reality of the loss. ACCEPTANCE: “I can miss them and still continue living.” The ultimate goal of healing is to accept the tragic event as something that could not have been prevented and cannot be changed. Acceptance is not the same as forgetting. Instead, acceptance is learning to live again and to be able to reopen your heart, while still remembering the person who has passed away. Losing a friend or loved one is never easy. However, when you lose someone to suicide, it can feel different from other types of loss. Several circumstances can make death by suicide different, making the healing process more challenging. STIGMA AND ISOLATION: Talking about suicide can be difficult for those who have experienced the loss. Different cultures view suicide in different ways, and sometimes discussing it can be a challenge. This can also be made more difficult when the act of suicide conflicts with religious views. Suicide can be isolating as communities of friends each struggle differently to make sense of the loss they all experienced. Finding the right people in your support network who are able to help you experience your loss is important. Sometimes, this may mean seeking professional help in order to help you cope with your loss. In those situations it is recommended that you contact a counselor, mental health professional, or find a trusted therapist in the community. MIXED EMOTIONS: After a death by illness or natural causes, the bereaved’ s feelings may be less complicated than when the death is by suicide. When a death is by suicide, you might both mourn the person’s passing while also hold intense feelings about the circumstances of their death. Feelings such as anger, abandonment, and rejection can all occur after a suicide as well as positive feelings about the deceased. Sorting through all of these diverse feelings can make the healing process more challenging. NEEDING TO UNDERSTAND WHY: Understanding the circumstances of a death by suicide can sometimes lead us to asking “Why?” You may second guess actions, wish that you had noticed signs earlier, or wonder how you could have acted differently. This need to understand “why” may be a difficult path, as the circumstances surrounding the loved one’s death could be unclear or not easily known. Some questions may never be answered, while you may find other answers that make sense. Sometimes you will find answers to your questions, while other times, you must learn to accept the fact that there are some things no one can know. RISK FOR SURVIVORS: People who have recently experienced a loss by suicide are at increased risk for having suicidal thoughts themselves. After experiencing the loss of a loved one, it’s not uncommon to wish you were dead or to feel like the pain is unbearable. Remember that having suicidal thoughts does not mean that you will act on them. These feelings and thoughts will likely decrease over time, but if you find them too intense, or if you’re considering putting your thoughts into action, seek support from a mental health professional, counselor, trusted adult, or call 911 immediately. The Suicide Prevention Hotline – 1-800-273-TALK (8255). SEEK SUPPORT: It’s very important to find people in your life who are good listeners, so you can turn to someone when you need extra support. You may find it helpful to talk to a friend, family member, mental health professional or spiritual advisor. Some find joining a support group helpful since each person will be able to relate in different ways to your experience. Whatever support looks like for you, it’s important to reach out for help when you feel like you need it. BE PATIENT: Just as you may be feeling a range of emotions, people around you may also be sorting through their feelings. Be patient with yourself and others: those who are supportive of you as well as those who do not seem to understand. Limit your contact with those who tell you how to feel and what to think. Take time to heal. Set limits for yourself, and give yourself permission to say “no” to things that may come your way. It’s difficult to make decisions when you’re feeling overwhelmed; you may decide it’s best to put off important decisions until you feel ready to make them. STAY PRESENT: Take each moment as it comes. That way, you can better accept whatever you’re feeling and be able to respond in the way that is most helpful to you. Maybe you would benefit from calling your best friend. Maybe journaling would help you let go of your thoughts for now. Learning mindfulness or relaxation techniques like deep breathing can help you stay present and experience your emotions without feeling overwhelmed. Your local community may have a Mindfulness Training Program where you can learn to be present and meditate. EXPRESS YOURSELF: You can choose to tell others how you’re feeling or acknowledge your feelings privately. If you don’t feel like talking, you can set aside time each day to grieve. Just make sure you leave enough time to do something pleasantly distracting before bed. Either way, acknowledging your experiences helps. ALLOW YOURSELF TO HAVE FUN: Social events or pleasant activities can provide relaxation and distraction. Laughter heals, and it’s also OK if you cry. Get back to things you enjoyed and make it a priority. ESTABLISH ROUTINE: Even getting dressed may seem challenging, but it’s important to reestablish routine as soon as you can. Building in some structure can help you manage your grief and provide a sense of normalcy and hope. TAKE CARE OF YOURSELF: Eat as well as you can, exercise when you can, and avoid alcohol and other drugs that will make it harder for you to work through your feelings. 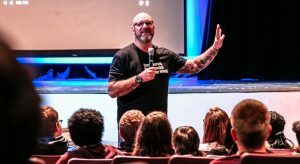 ** Jeff Yalden is a suicide prevention specialist who works with education, high schools, middle schools, parents, and communities to deal with a loss and the grieving process. 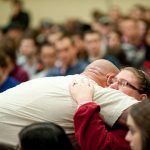 For more information on Jeff and his inspirational motivational school assemblies, please visit www.JeffYalden.com.